Learn how to green your doctor’s office or clinic. Report from PSR National and American Council for an Energy Efficient Economy on the health benefits of energy efficiency. 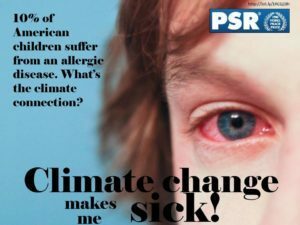 Climate postcards from PSR National with information on the health effects of climate change from extreme weather, heat, vector-borne disease, and more. PSR’s CHAT program offers webinars and other resources to help you advocate for the Clean Power Plan in your state.